I've started to learn Unreal 4 engine few weeks a go, and naturally (because I am in the middle of my mm6 gameplay ) , I wanted to see how New Sorpigal would look inside it. With the help of Grayface editor, I was able to extract whole level, bring it to 3DS Max, clean it up a little (mostly smoothing groups), and I was able to then import it in Unreal. Oh man, I was happy then. I am not recreating the game. Nothing programming related. I don't have the knowledge, and time to do it. At this point, I have zero knowledge about unreal blueprint (visual programming editor). Anyways, I started with replacing the textures. Most of the ground textures is finished, I've made 1024 res textures. 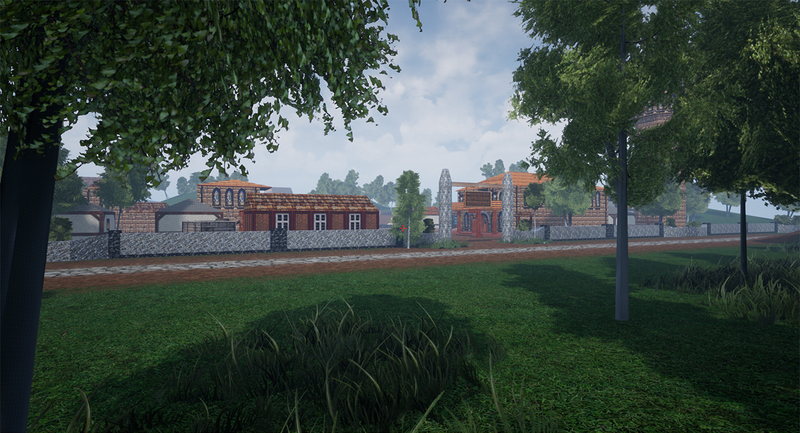 Then I added some free foliage (trees mostly), from free unreal assets in the assets store. Sorry about fast mouse movement. When I was recording everything was like slow motion. That's it, feel free to suggest anything, to like it, or dislike it, to give ideas... etc. Hi! 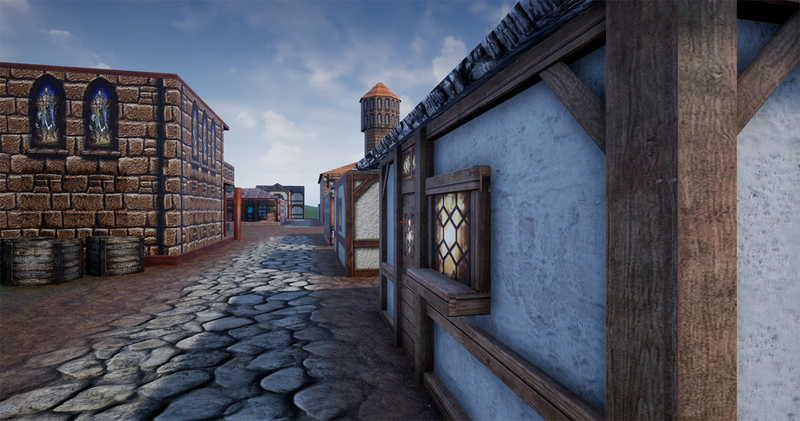 This UE4 version of New Sorpigal looks nice, it is a great proof of principle. Last edited by unknownone on Aug 26 2018, 7:30, edited 1 time in total. OMG this is absolutely fantastic, I would so much play this, it's like an HD remaster!! Last edited by Galaad on Aug 25 2018, 16:27, edited 1 time in total. Yes! This is exactly "proof of concept" that I am trying to do. Let's see how much we can push this out, and if it turns out good, we can all scream at Ubisoft to make a remake. I don't think they care at all, but.. we can dream. Anyway, I am positive that remake of this game could be financially very rewarding, because it has all in it, and with a huge graphics changes, and minor UI/Concept changes, young generations would accept it better then Assassins Creed. I am trying my best. My demo (if ever will be finished) wouldn't be playable game, but at least you could walk on the level. I've already tried to make an exe file of this, but some errors occurred, and I must ask for advise on Unreal forum. Once that is sorted out, I will be happy to upload exe file, anytime you guys want. Trying to remake (re-model, re-texture) basic house in New Sorpigal. I've taken one of the houses (that are same) of Body, Spirit, and Mind Expert teachers. Still not very happy with the results, but this is the progress so far. I am still unsure should I re-model all houses like this (adding extrusions, separate planks models... etc), or should I keep the initial models intact, and just change the textures. I've tried to stay as much as I can with the original design. Although, I am kind of 3D generalist, my primary skills are certainly not modeling and texturing, so any advice is very appreciated. And also, every comments from a true MM fans are very appreciated (in terms of how do we keep the same feel, yet, improve it). Concerning the house, I believe that the original designers went with textured flat buildings to keep the polygon count lower and make the game more accessible to the people at that time. Probably, if they were to do it now, they would make more detailed buildings like the one you did. Extruding the details in the textures seems to me the way to go, but obviously within your time constraints. There was a thread in the forum about a Unity implementation of MM6 remake, could this work in UE4 benefit or contribute to that, at least for the models? Fun stuff So weird to see actual horses in MM6 location! If you could do a youtube video showing exactly how you did this maybe someone (or group) will be able to recreate the entire world? Very nice, d4rk3lf! Just watching that you single handedly, and only for the benefit of learning a tool, remade visually a part of a beloved game, makes me feel like a fan-made-high-quality remake version of the game is quite possible, although, as for all the fan-made stuff, it must be squeezed in everybody's schedule, and it might ever take a long while to see an end. As I said in Youtube comment, good luck with your endeavour learning this tool and I hope you find the results you are looking for. Wow this is great - I know that this is the low hanging fruits and all the 2d stuff and gamelogic is missing - but I cant help wondering if something like the 6-7-8 merge could be possible in UE or some other modern game engine and then improved iteratively. Dunno if the guys doing the MM6/7/8 engine recreation are still working on it, but you may want to try talking to them? https://github.com/pjasicek/OpenMM8 - not been touched since August though. Very glad you like it! Sorry for the late reply, but I was very busy with regular work. Bad news is... my regular work is still keeps me away from this... good news is... most of my new regular work is connected with Unreal 4, and knowledge I get will be of use for future updates (I already see what pile of crap I made on this project ). unknownone wrote: I totally agree with you. Concerning the house, I believe that the original designers went with textured flat buildings to keep the polygon count lower and make the game more accessible to the people at that time. However, now I see that I made a mistake with the house, and I go away from the goal. The point is "big picture" overall, and if I start remodeling house by house, that would lead me to endless loop trying to preserve as much of the original design, and yet improve it to modern standards. That's not a job for one person... at least... not for the person with my (limited) skills. 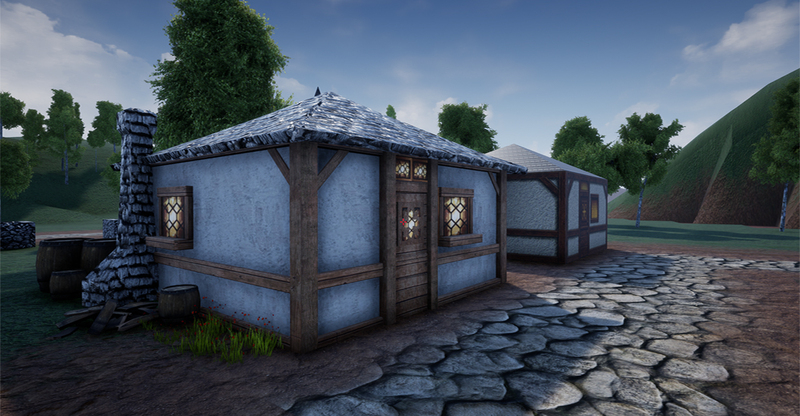 I think I'll leave houses as they are, I will improve the materials (and textures) on them, and just build on top of them. Adding flowers here and there... adding barrels... dirt... grass... stones... something like I did with first update. unknownone wrote: There was a thread in the forum about a Unity implementation of MM6 remake, could this work in UE4 benefit or contribute to that, at least for the models? Well, with Grayface tool, anyone is able to get fbx (3D model file) with textures. Both Unreal, and Unity and Cry Engine, and any better engine or app is able to import fbx... it's really not big deal. To answer (more precisely) on your question: I think I saw that thread with Unity. However goals for me and that guy are different. He wants to recreate the whole game, while my goal is much simpler. I just want to recreate walking on just one level (no enemies.. nothing), and just push the graphics as much as I can. My knowledge is very limited on that matter. Last edited by d4rk3lf on Oct 31 2018, 20:34, edited 2 times in total. Echo wrote: Fun stuff So weird to see actual horses in MM6 location! Glad you notices the horses man. That was my long waited wish. When I was playing this on my teen ages, I was thinking: why didn't they put just 2 sprites of horses, it would make more sense. I hope I will be able to import some animated horses. Not much of animation... just a standing loop... and perhaps another horse outside eating a grass (and having a free day ). I hope, at some point, someone will recreate the whole franchise. I've played MMX.. I am not overly impressed, however, I much liked the fighting system. That remind me somehow on Disciples 2 battles. sherwin_p wrote: If you could do a youtube video showing exactly how you did this maybe someone (or group) will be able to recreate the entire world? Thanks mate, but you're overextending of what I did. Fell free to ask anything you want, and I'll gladly explain. 1) Exported with Grayface patch - imported in 3DS Max. 4) Imported in Unreal in some of the preset walking scenes. 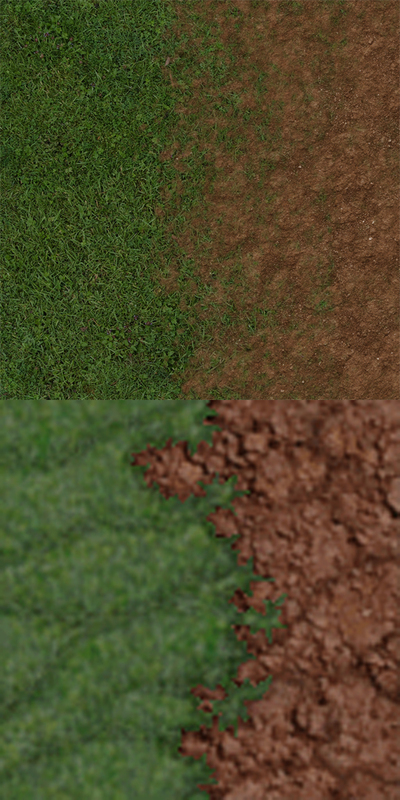 I imported texture of the grass in Photoshop (it was very low res(maybe 64x64px)), and I searched on google for similar looking grass textures. I made a 1024px texture as close as possible to original... 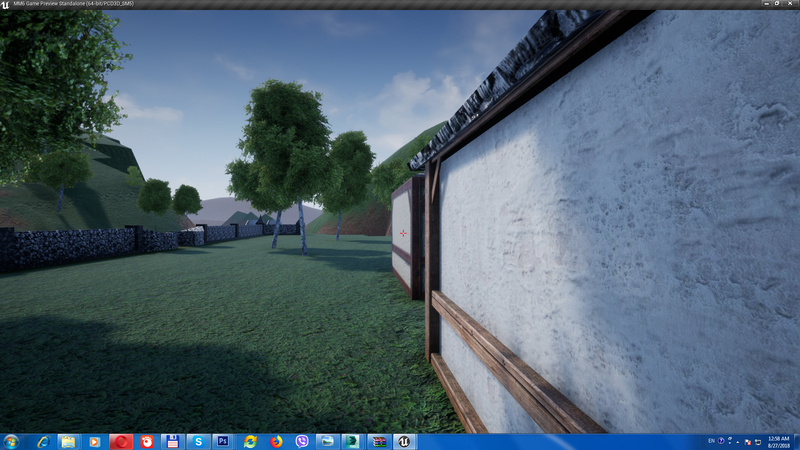 I just reimported new grass texture within Unreal. After I solved the basic ground textures (but I still didn't do... for example... the vulcano ground textures on Islands on New Sorpigal), I imported in Unreal a free foliage preset that I download from their marketplace (few trees, few flowers and few grass)... I just scattered trees... few plants at the beginning.. I didn't wanted to overdo-it, though... it's very easy to overdo the foliage... however, this is just a start. Same for the barrels, and some other stuff (like horses)..
And that's it.. I recorded, and uploaded video. Panda Tar wrote: Very nice, d4rk3lf! Just watching that you single handedly, and only for the benefit of learning a tool, remade visually a part of a beloved game, makes me feel like a fan-made-high-quality remake version of the game is quite possible, although, as for all the fan-made stuff, it must be squeezed in everybody's schedule, and it might ever take a long while to see an end. I understand you completely, but consider this. And that is for some super-talented multi oriented person, with prior HUGE experience in Unreal ... not me. As for the teams, it gets even more complicated... You gotta find great artist, programmers, then wait for their free times to do their stuff... then programmers will wait for artist for 2 months to provide them assess (or opposite), it's very hard to determine who is in charge, because no one pays. Again, it's not impossible, there were a few successful team work remakes, but a million unsuccessful. Troller wrote: Wow this is great - I know that this is the low hanging fruits and all the 2d stuff and gamelogic is missing - but I cant help wondering if something like the 6-7-8 merge could be possible in UE or some other modern game engine and then improved iteratively. As I replied to Panda Tar, same goes here. As for the grass, terrain support.. yes... I will try to do that. Sslaxx wrote: Dunno if the guys doing the MM6/7/8 engine recreation are still working on it, but you may want to try talking to them? https://github.com/pjasicek/OpenMM8 - not been touched since August though. These guys are doing much more serious stuff then me. I am only trying to recreate the graphics (and only on 1 level - New Sorpigal). We have a different goals. I don't think I would be of an use to them, but I would be glad to help anyone... individuals, or teams... of course, if it don't require many hours. Thanks anyway, I am really proud of such strong response of MM6-8 fans of something I did. And I really did nothing. Love you guys and girls! d4rk3lf, Mate, you are genious.... can't believe when saw your amazing screenshots of new sorpigal. Please try to keep up your work. It has extremely high potential. Would love to play it sometimes in the futur. And would also like to help you if I can. I have little photoshop skills. Really looks great, kinda captures the feel of original. Kinda feel bad such tools as UE and Unity were not so readily available when there was momentum for fan made games. Of course recreating something of such scale even with tools would take years and dedication(think its one of things that killed mmt and other - unrealistic expectation, as people involved never realized the magnitude of effort it would actually require), so i wont hold breath for anything serious, still nice to just see such a game in new wrap even if they are "stills"
Yeah, over-ambition kills a lot of projects, fan or otherwise. But keeping it small, like this, does pay off. Actually, not that big, but this time, you can test a scene by yourself (I am giving you an exe file), and walk within the project. I had to recreate the whole scene, because the previous project had bug, and wouldn't let me to give you an exe file. As you see, this is just WeTransfer upload, and it will be available only 1 week. If anyone have some free space on FTP, and can upload it there (it's less then 1GB), and give us a link here, it will be very appreciated. It looks to me like it's pretty fit for MM6 version of the Goblin. Cool! I'll play it later today. The goblin looks fine. It reminds me a lot of Dobby, the free-elf. Regarding the EXE file, if you have Dropbox, you could host it in there. Even the free-version allows you to host 2GB of files, if you will. Unless you already have it and it's already full. I think Google also has this free HD service, Google Drive? That way, you wouldn't depend on anyone for hosting issues. P.S. : You can see HERE that this free pack has a griffin in it, hohohohoh. Last edited by Panda Tar on Nov 26 2018, 14:23, edited 1 time in total.